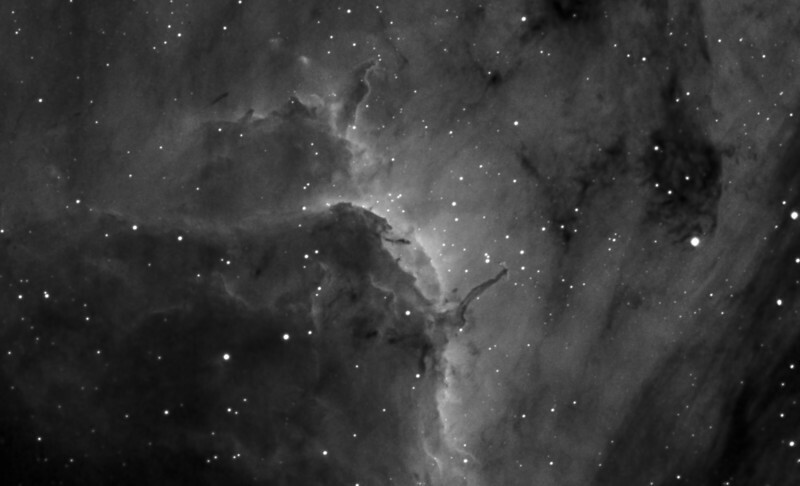 Pelican's Neck Ha 4x30m bin 1x1 TEC 140 @f5.6 and ML8300. Taken by Lynn Hilborn August 3, 2012. The prominent ridge of emission featured in this skyscape is designated IC 5067. Part of a larger emission nebula with a distinctive shape, popularly called The Pelican Nebula, the ridge spans about 10 light-years and follows the curve of the cosmic pelican's head and neck. Fantastic, dark shapes inhabiting the view are clouds of cool gas and dust sculpted by energetic radiation from hot, massive stars. But stars are also forming within the dark shapes. In fact, twin jets emerging from the tip of the central, dark tendril are the telltale signs of an embedded protostar cataloged as Herbig-Haro 555. The Pelican Nebula itself, also known as IC 5070, is about 2,000 light-years away. To find it, look northeast of bright star Deneb in the high flying constellation Cygnus. Text from APOD.